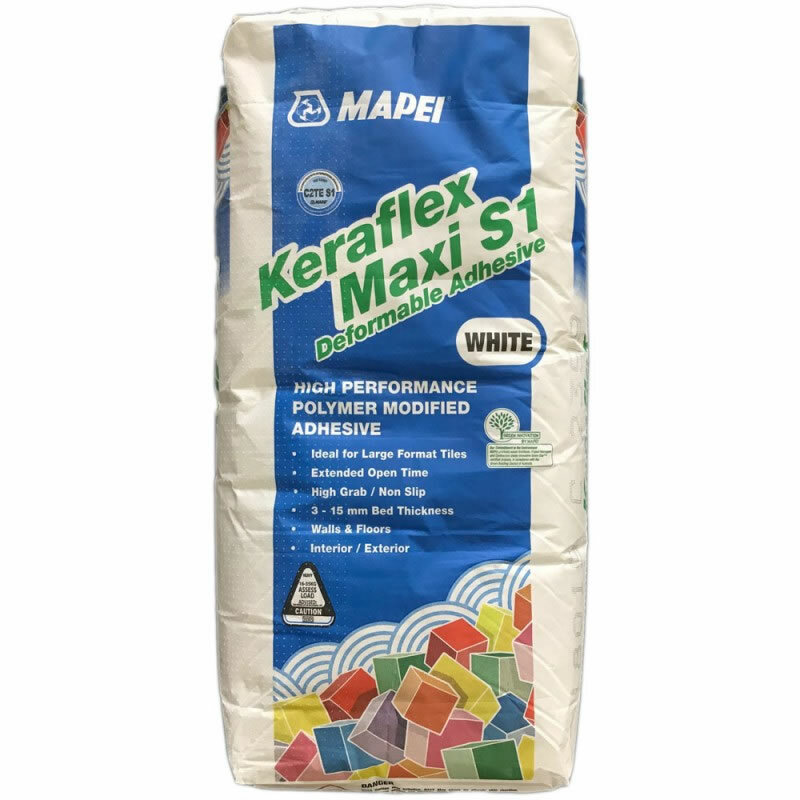 Keraflex Maxi S1 contains a very low VOC content that can contribute valuable points towards Green Star™ credits in compliance with the Green Building Council of Australia. • Interior and exterior bonding, up to 15 mm thick, on floors of ceramic tiles of every type and size (single and double fired tiles, porcelain tiles, klinker, terracotta, etc.) on uneven substrates and renders, without having to level the flooring beforehand. • Interior and exterior bonding of stone and agglomerate materials (provided that they are classified as stable and not irreversibly sensitive to moisture). • Spot bonding of insulating material in interior such as expanded polystyrene, rock and glass wool, Eraclit® (wood-cement panels), sound-deadening panels, cork, etc. – compatible sound insulation membranes. • Ceramic and stone material tiles on existing flooring (ceramic, marble, etc.). • Installation of floors subjected to heavy traffic. • Installation of floor and wall coverings on substrates waterproofed with Mapelastic AquaDefense, Mapelastic Smart and Mapegum WPS. • Interior and exterior bonding of tiles or strips (porcelain tiles, klinker, single-fired, terracotta) with highly profiled ribs or lugs. • when surfaces need to be immediately trafficked. Gully Garden Supplies are family owned and operated business for over 30 years, we are market leaders for exposed aggregate and designer mixes, we have a fully computerised batching plant and can supply and deliver on request. Monday to Friday: 6.30 am-4.00pm.